Yesterday I was lucky to have my old re-enactment friend Chris Scott available to play out a couple of actions from the Peninsular War campaign. In the first he had a personal interest. He plays the role of Don Cristobal d’Escozia, the renowned commander of all guerrillas in Spain (and the only fictitious overall commander in the game). One of his sub-commanders with orders to capture some French cannon decided to ambush them en route in broad daylight. 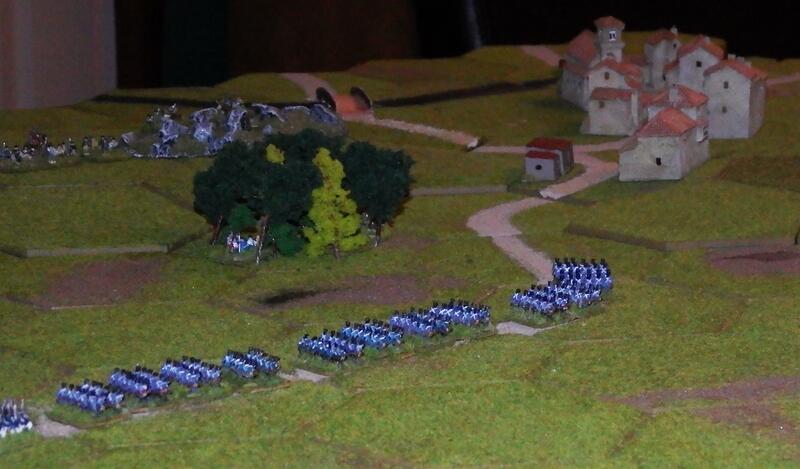 We played the game using 6mm miniatures on a hexagon terrain board, using Commands & Colors Napoleonics rules. I had to invent characteristics for the guerrillas, and as they would be outnumbered 4:1 I was generous. They had all the advantages of light Infantry in firing, the advantage of French Line in mêlée and could use rugged hills (normally prohibited) with the same protection as villages. Also, they has one base per 12 men whereas their opponents had one base per 24 or 36, according to type. I was disappointed that I had not had time to paint up the Neapolitan Light Infantry from my Baccus collection, but I had loads of Irregular Miniatures chaps based up as French Light Infantry, so with a quick flag repaint they were ready, and due to scale differences I used the same manufacturer throughout, except the Guerrilla leader who is a splendid chap by Heroics & Ros that I bought, fully painted complete with leopard skin cloak, in the distant past. Guerrillas in the mist. The commander with some of his brave chaps. Both sides were given the same territorial objective. To get the two gun models and two caisson models under their own control beyond the river using one of two bridges. Each would count 1 Victory Banner. The game would be won by the first to gain five banners, so at least one enemy unit had to be eliminated. The French column marches into the trap. The Guerrillas start to search for a better mousetrap. Despite routing the first two Neapolitan companies in the column, the ambush party was surrounded and annihilated in the woods. The other guerrillas moved into the village in blocking positions, except one company that (due to the lousy hand of cards held by Chris) was left out in the open to be picked off. I drew a lucky card allowing a strategic move and got the guns onto the hill overlooking the village. Two guerrilla bands attacked them (before they were deployed) but rolled appallingly and failed to hit anything, while in both cases the guns replied with devastating effect. We both agreed that the rules for this cannot be correct. Even allowing for the effect of canister at short range if frontally attacked the artillery have too much power. We were playing with miniatures, so the tactical situation was different to that of the board game, but I ruled that in future. 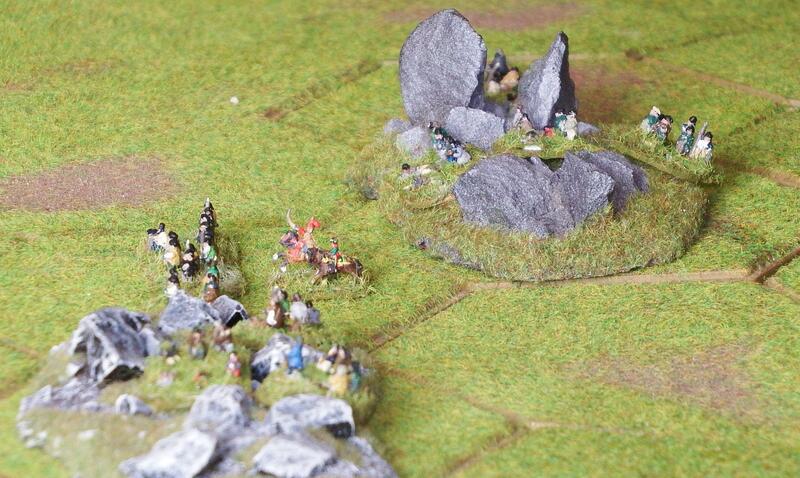 The final result was that the Guerrillas lost three units (11 of their original 16 bases). One company of Neapolitan troops was destroyed and a second ran for the hills (overall French loss 7 of 24 bases). The Guerrillas withdrew from the field, so technically it was a draw. Following this engagement I have also changed the way that Guerrillas will operate in the campaign. If they encounter a lone ADC or a party of enemy less than half their own strength I will adjudicate the event with a couple of card draws to determine losses (if any) on each side, as I previously did whatever the odds. Otherwise if a party of guerrillas is in the same map square (10 miles x 10 miles), the enemy will be moved backwards along his intended route by 1 mile per 25 guerrillas (actually calculated with a finer degree of accuracy in my records). This will represent the delays caused by ambushes, the necessity to scout ahead for ambushes and other disruptive activity. As an example a band of 100 guerrillas could slow an unencumbered infantry battalion from 20 miles per day to 16 miles per day on good roads, and from 12 miles per day to 8 miles per day in the mountains. And so, having very quickly resolved this encounter, Chris offered to assist with another that had arisen in the previous 24 hours. In this battle the vanguard of an Anglo-Portuguese Force has approached a well-defended town in Portugal. They have observed and fallen back to await the rest of the division. However the French spotted the column and have sent a strong battalion out to investigate. They know there are wagons to be captured (but the British officer has withdrawn them to safety). Although the Portuguese had orders to hold the position, seeing the isolated French force, I sent them forward. They had some success, but Chris moved the rest of the French battalion to the left and drove them back with heavy casualties. The end of the affair. The Portuguese have fallen back defeated, the British are advancing and the French have quit the field. The guerrilla game sounds like it was a real blast (pun intended), even with the houseruling-on-the-fly.